Identification: Forewing is dark gray to blue-gray with narrow black dashes, a dark wavy submarginal band, and a light gray streak outside the submarginal band. 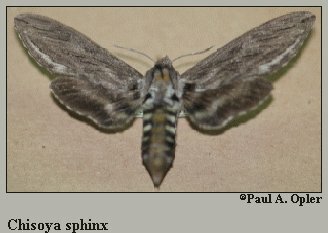 Hindwing is dark gray with 2 diffuse, light gray bands. Wing Span: 2 3/4 - 3 1/4 inches (7 - 8.2 cm). Life History: Fully-grown caterpillars pupate in underground chambers. Range: South Texas south into Mexico.